It seemed unimaginative to eat breakfast at the same restaurant we’d had dinner at the night before (more than we could possibly eat catfish- pictured below) but a place with a good dinner cook deserves a closer look for breakfast and the kitchen on the houseboat that we’d spent the night on wasn’t stocked for the season yet. My fishing buddy Jeff has summered in the area for years and he likes Cedar Hill Restaurant at Cedar Hill Marina and now they can count me as a big fan too. We had a fine breakfast and dinner there with great service and I’d recommend it to everyone that enjoy’s good Southern Style food in a family friendly atmosphere. Here is map to the place. From our table in the restaurant we could see the lake and the very area we had planned to troll. We needed to make a final decision about where to fish that day because trolling the lake out of Holly Creek Marina off of Willow Grove Marina and down lake to First Island the night before hadn’t produced even a strike. After seeing no good options: Cumberland / Cordell Hull full of logs, Center Hill / Great Falls a mess with debris on the upper part that I like and Percy, Cheatham and Old Hickory just too close to work and the city. The streams and rivers were all full to the banks: upper Caney Fork, Smith Fork, Stones River, Harpeth and Collins . We’d decided to stick with Dale and keep the Obey River tail water as plan B but because of having trolled without a strike the evening before and the trolling motor fouling and now being unusable we decided to fish the Obey River instead of Dale Hollow itself. Obey River Grand Slam here we come! Just the day before I’d asked Stephen Headrick at Punisher Lures about boat fishing the Obey River and he described the stretch between the Donaldson Park Ramp in Celina and Moody Boat Ramp upriver as “not fished much” but he’d been helpful and had encouraged me to give it a try to let him know. Usually when a place isn’t fished much there is good reason but sometimes you have to see for yourself. This run of the Obey river has been on the Tennessee bucket list for several years now and I was curious as to what we’d find in the 6-7 miles of river up to the dam from the Donaldson Ramp. They were operating two generators and running about 8000 CFS through the dam so the water was high and moving right along but not too dangerous. It took us a little over an hour to make it to the dam just putting along and we intended to fish making drifts on the way down while using the trolling motor to control the boat and keep us out of the trees. We fished pretty hard but only had one fish on briefly and a couple follows. We never did any fly fishing though I had intended to but we were kept too busy controlling the boat which is new to me. We used spinning gear and small Rapalas, a couple of spoons and some curly tailed grubs. It was the Rapala’s that got the follows, the water was clear and we saw a couple nice Bows but the fish just weren’t active or we weren’t good enough. We only saw one other boat that day on the Obey River. I wonder how they did? This is a test for laying out photos with text via new software and as you can see so far it’s not going too well….but I thought it a good opportunity to tell a fishless tale about a pretty stretch of the Obey River that I’m still not convinced isn’t fished much for good reason. I’ll be back to try it under different conditions, I sure would like to fish it at night under no generation for some big browns. And I can’t believe this section of river doesn’t serve up some fine trout dinners to big Rockfish cruising up the Obey from Cordell Hull Lake and the Cumberland River. I’m convinced that a world record striper will be caught out of these waters within my lifetime, it’s awesome striped bass water! 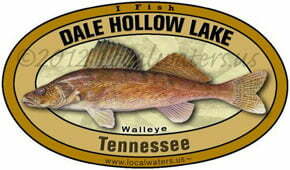 When Jeff left the ramp I noticed that he still had the old Dale Hollow Walleye decal he’d put on his truck well over a year ago. I took a photo because last summer he’d peeled this one off his old truck to use on this new one and I wanted to see how the “Second Life” of this little sticker was coming along. The decal looked good as new to me because of the heavy UV laminate that protects it from the sun. We’ve tested these up to two years in sun and rain and it looks like the life will exceed five years.